DETROIT – Honda used its global network to re-establish the Civic as one of the best small cars in the world. And depending on what you like, they’ve come close. The development team for the 10th generation of the Honda Civic was led by the company’s North American staff, a first. Honda’s research and development operations from Japan, Europe, South America and Asia were also heavily involved. The 2016 Civic is a compact car on these shored but globally it is a C-segment vehicle. From front to back, they changed just about everything. The architecture, read platform, is new. Both exterior and interior styling was changed. The car is bigger and that yielded more interior space. There are two new engine choices and more trim lines. The new Civic bordered on edge design. It had crisp swept back body lines and a sharp aggressive face. There were bulging wheel arches, the hood had sharp character lines and the grille was highlighted by a chrome plated Honda wing. And there were new LED headlights. Thin A-pillars created an open cabin and arching C-pillars melded with an aggressively sloped roof in the rear. There were also LED taillights. The body side lines were also sharply creased and curving and swelled over the rear wheel arches. It was a modern edgy look. The 2016 Honda Civic design was anything but boring. Inside, the longer wheelbase and wider body created more interior space. Soft touch material was used on the instrument panel, front door sash and door inserts and on the larger more thickly padded center armrest. Fit and finish was top notch and the cabin was ergonomically friendly, we didn’t have to reach for anything. We had the 2016 Civic 1.5T 4D Touring. This compact sedan was the top of the line. The first thing we noticed when we opened the door was the leather trimmed seats. Perforated, the front set had a defining stripe on the seat cushion and on the seat back. They were comfortable, power adjustable both driver and passenger and heated. We were surprised as we checked out the back seats, though they didn’t have that defining stripe, they were heated. There was plenty of head room and there was hip room galore. Leg room as well as foot room was ample. The 2016 Civic was a very comfortable car. The front seats were of course even more comfortable. They felt like high-back easy chairs. The instrument cluster was a digital screen broken into three sections with the speedometer in the middle. The fuel gauge was on the right and the temperature gauge was on the left. The steering wheel was crammed with controls including the adaptive cruise control system. The touch screen looked like a mini-iPad. The only thing we didn’t like was that the audio controls were all digital, no knobs, just touch. Under the hood of the 2016 Honda Civic Touring was the 1.5-liter direct injected turbocharged engine. It made 174 horsepower and an eyebrow raising 162 pound-feet of torque at 1,800 rpm. It had a continuously variable transmission or CVT. The combination got 31 mpg in the city, 42 mpg on the highway and 35 mpg combined. The engine was quiet but the CVT did make a little noise during moderate to hard acceleration. But overall, the 2016 Civic was quiet, handling was sharp and the cars driving characteristics were pretty good. Engineers put a lot of work into reducing The Civic’s noise, vibration and harshness, NVH in automotive lingo. They used acoustic glass for the windshield, triple door seals, new hood seals, sound absorbing heat baffle and hood undercovers, A, B and C pillar separators, new rear wheel house liners and formed fiber carpeting. 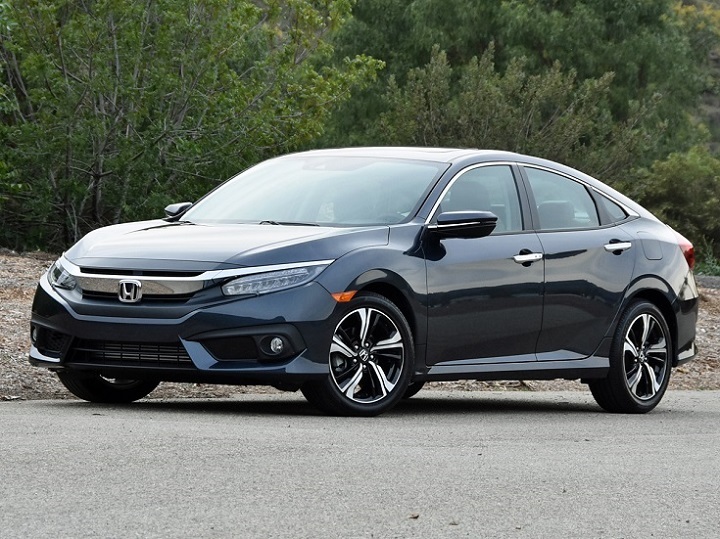 All of this gave the 2016 Honda Civic the ambience of a much bigger and more expensive car. In addition to adaptive cruise control and heated seats fore and aft, this 2016 Honda Civic had a moonroof, voice controls, SMS text messaging, HD radio, Pandora internet radio interface, Bluetooth, satellite radio, smart phone apps and auxiliary and USB jacks. There was what Honda called a sensing package. It included collision mitigation braking, forward collision warning, lane departure warning, lane keeping assist and road departure mitigation. The radar cruise control was also part of the package. The 2016 Honda Civic Touring was chock full of creature comforts. And for $27,335, it was a bargain that no doubt competitors are scrambling to match.